When you first choose to start a new game, you're presented with a list of starting heroes, who aren't too different statistically: Two of the male characters have low dexterity, and the two ninjas have extremely low constitution, but there's nothing that couldn't be tweaked to your liking within a few levels. More important are the weapon skills: Each character is well-trained in a couple of weapon classes and poorly trained in the rest. Choosing a starting hero sets your starting location and culture, determining who's friendly with you. Each culture specializes in a couple of weapon types. Once you select a character, you'll start in your home town. Here you can hire troops at the barracks, buy and sell equipment at the forge, check stats and take on quests at the town hall. You can also buy healing potions and scrolls at the temple. In other towns, you can also try to forcefully take them over through their town halls. At first, all you'll want to do is add an extra warrior or two to your roster and head out on a quest. Enemies drop a lot of items, so you'll quickly have more equipment than you know what to do with. Sell it to the forge for a profit. You can lose any number of troops in a battle, but death of your main character means, well, game over. Early on, it's best to hang back and let our forces attack and eventually you'll have stats and items powerful enough to hold your own with even the toughest enemies. A ranged hero can be useful in the early game, transitioning to a melee weapon of some sort just in case. Don't forget about quests! They provide easy money early on, and rogues' dens offer safe and easy experience compared to attacking a town. If you don't like a quest (say, delivering a package to an island early on), just ask for another quest, and it will automatically cancel your previous one. You can have one quest active from each city at the same time. The game is all about replacing your equipment as you find better ones. Remember, a higher attack speed is faster, and hence better. And you should always use a new replacement if it's better than your current equipment, assuming you can use it within a level or so. 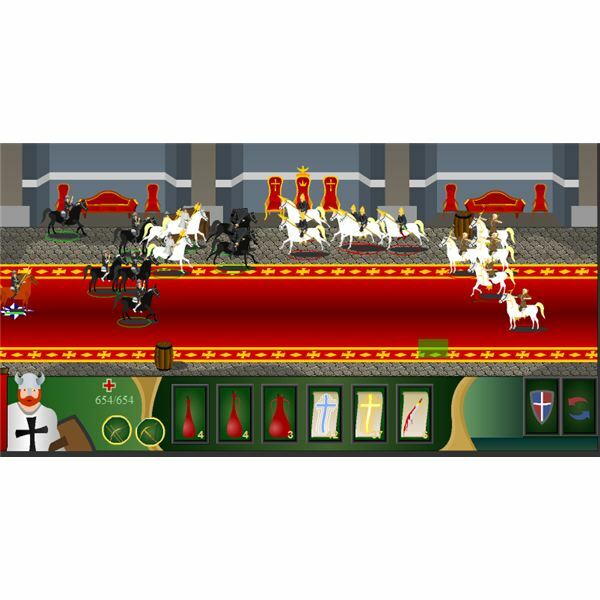 Combat in the Feudalism flash game features enemy archers who tend to attack their nearest threats. You can use this behavior to your advantage. Hang back if there are several ranged attackers and if you're not strong enough to take the hits, let your forces act as a shield for you. Just remember to keep them healed with scrolls! When it comes to consumable items, scrolls are both far more effective and more efficient than potions: the damage they heal scales up as you gain hit points, while potions only heal a flat amount. That's not even taking into account the fact that scrolls heal you and your allies, while your potions only heal you. They're also cheaper. It's really no contest. Random encounters and rogues' camps tend to increase in size and difficulty as you level up. Town and city garrisons do not. So, take your time and prepare properly before you attack a town. Shops rarely sell items more useful that what you're able to salvage; hired soldiers often are the most useful purchase. If your main character keeps getting killed too early in a fight, try hanging back and using defensive scrolls early on in a fight. Alternately, go on a few quests and pick up a couple of levels, boosting constitution for more hit points. Castles have two levels in their garrisons: the outdoors city area, then the indoors castle guard, with no opportunity to heal or purchase supplies or reinforcements in between. Plan accordingly. Some towns contain stables offering horses for sale. 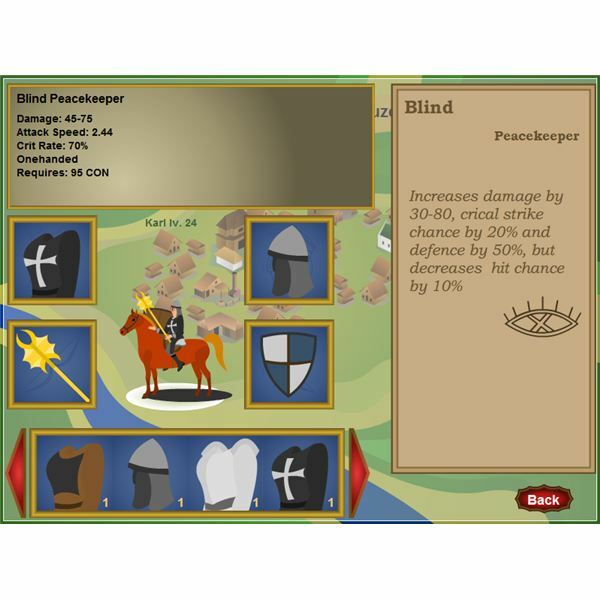 Each horse provides a different bonus to hit points, defense, and movement speed. Remember that speed is more valuable than anything else. The ability to quickly escape from a tight spot or rush behind enemy lines to take out archers is invaluable. Remember that you can't wield certain weapons, such as dual-wielding a pair of one-handed weapons, from horseback! Each character generally needs one weapon skill and possibly one ranged weapon to be effective in combat. Anything more than that can usually be better spent on primary stats. It is very important that you boost your Art of War and Patriotism skills (which require intelligence as well) as soon as you're an effective fighter in combat. Patriotism isn't useful if you're not attacking with your culture's troops, so you should consider taking some of your culture's troops with you into every combat. It's twice as effective as Art of War on your same-culture forces: maxing out at 100 skill levels doubles their damage and HP on top of the +50% from Art of War, so it's incredibly useful for keeping them alive. Each of the two skills acts as a force multiplier; since you're limited to 12 allies out at once, that's incredibly useful once you have more allies than that and need to keep extra in reserve; it means each one can stay alive longer. In each battle, every item you find has a chance to carry a magical enchantment or two. Town guards are likely to drop several of these, and their effects can be extremely powerful. By the end of the game, you'll most likely be decked out in the stuff. Check the description of each new magic item you find — their bonuses aren't reflected in the stats of the item, and you wouldn't want to overlook a huge bonus to hit points or damage. Watch for magic enchanted items that grant 50 or more damage and those that provide 50% or more bonus hit points. Later enemies can do a lot of damage fast, so you want well over 500 HP before attacking a castle, and at least 1000 HP before attacking a capital. Keep an eye out for combinations that reduce and improve the same stats, too. If you can nullify one enchantment's drawbacks with enchantment improvements from another item, and end up with a net positive benefit, go for it! Don't hesitate to swap out two or more items to make it happen. Eventually you'll want to buy passage on a boat, but not too early. $4000 is a hefty sum starting out, and you have to spend it each time you want to cross the seas; access to the boat is not a permanent purchase. Don't start a war until you're prepared to finish it. Once you take another culture's town, its people will hate you until you conquer all of their cities. You will be prevented from buying healing items or equipment from any of their towns you haven't captured, not to mention forced to fight their garrison immediately upon arrival. Instead, it's best to take over your own culture's towns first. You won't go to war with your own culture, so the merchants will always deal with you and you won't have to fight the town garrisons (unless you choose to). Once you've captured your capital, the game becomes a lot easier; while attacking another country, you're not likely to find magic weapons or armor with better damage and defense values and enchantments than the ones you picked up during your way to the top — and if you do, they're even less likely to be equipment that you lack the necessary stats to wield. However, at this point, you'll have so many levels and spare points you can basically train whatever you need to pick up and use the shiny new replacement. The last achievement is yours once every town and city has fallen under your sway. Then, you can sit back and enjoy your empire, because the game is under your sway. Congratulations!